Bev, Zen and I freely admit Japan is our favorite destination in the entire world! Japan is singular among Asian cultures in its amazing ability to assimilate and then synthesize foreign cultures and influences. The contrast between Japan’s orderly, balanced Shinto/Buddhist-centered culture and its hyper-innovative technology-driven economy is compelling. A big part of our fascination with Japan is its unique wabi-sabi aesthetic. Wabi-sabi is a Japanese worldview/state of mind emphasizing simplicity and purity—the beauty and awe of all things humble, imperfect and unpretentious (a beautiful sunrise, the still morning frost, a graceful Japanese tea ceremony). The critical thing is savoring life’s simple daily pleasures. Please note our various meticulously-detailed Japan private tour itineraries, based on our family’s many travels to this amazing land. Upon arrival in Tokyo, you will be privately transferred to the Aman Tokyo or the Peninsula Tokyo. While in Tokyo, you may be able to catch a sumo wrestling match. Your touring today begins with a visit to the Meiji Shrine, where, based on Shinto tradition, you can write your prayer on a wooden block just outside of the shrine. You will continue on to Higashi Gyoen, the east garden at the Imperial Palace, considered to be one of the most beautiful gardens in all of Tokyo. You will also visit the Akihabara and Harajuku shopping district and the Yasukuni Shrine, controversial due to its enshrinement of Japan’s wartime leader General Hideki Tojo and 13 other Class-A war criminals (found guilty of war crimes by the allied forces after World War II). You will travel to the Mt. Fuji visitor’s station and taken to the 5th station on the mountain for the opportunity to hike the Ochudo trail. The Ochudo Trail, also known as the “boundary between heaven and earth”, is a walking path that circles Mt. Fuji halfway up the mountainside. This trek includes the Oniwa Garden and ends at the Okuniwa bus stop; this hike is roughly 2.5 miles and will take approx. 2 hrs. Following your energizing hike, you will be driven to Gora Kadan ryokan. After breakfast at the Gora Kadan, your private tour options will include Lake Ashi Excursion boats, Jinga Shrine, and the Owakudani Valley, an active volcanic valley famous for blacked boiled eggs! Another stopover is the Hakone Open Air Museum amidst a mountain setting, which successfully balances art with nature. The indoor galleries are also very interesting – most compelling is the museum’s significant Picasso collection. You will be assisted by our representative in boarding the Shinkansen train from Odawara Station to Kanazawa with a transfer in Tokyo. Upon arrival at the architecturally striking Kanazawa Station, you will be met by our representative for a tour of the Kenrokuen Gardens, before being transferred to the Kayotei Ryokan. Considered one of Japan’s three most famous gardens (the other two being Karinkuen/Mito and Koraku/Okayama), Kanazawa’s verdant, lush Kenrokuen Garden makes a stopover in this coastal city certainly worthwhile. Compared to our beloved Saihoji in Kyoto, Kenrokuen is a relatively “new” garden, initially created as the outer garden of Kanazawa-jo in the 17th century. Tour Kanazawa beginning with the Nagamachi district, one inhabited by samurai, and Kazuemachi, an old, less touristy geisha district located along the river between Asanogawa Ohashi and Naka-no Hashi bridges. Stop for lunch at Omicho Fish Market, Kanazawa’s largest fresh fish market conceived in the 17th century Edo Period. In the afternoon you will be transferred to the Kanazawa Station for your Thunderbird to Kyoto. You will begin your day in with the Philosopher’s Walk, a 2-kilometer long path that covers five temples and two shrines, paralleling a beautiful canal/stream. After the walk, you will continue to the Shirakawa Minami-Dori Street in Gion, which has wonderfully preserved wooden structures, with various restaurants and ryokans. In the afternoon, you will visit the Fushimi Shrine, perhaps our favorite shrine in all of Japan. Dating back to the 8th century, the shrine includes a wandering pathway around 3 miles up the mountain lined with hundreds of beautiful red torii, now faded to look orange. There is nothing casual or fortuitous about a visit to Saihoji Temple and its garden. You may visit by prior appointment only (written request to the administering monks.) Unlike the mass tourism that envelops much of Kyoto, the Saihoji priests hope to retain a solemn, meditative atmosphere in the temple and garden. You will also participate in a traditional tea ceremony with over a dozen steps including the respectful exchange of greetings, eating the tea sweets, mixing the green powder tea and water with the bamboo whisk. You will enjoy a full day tour of Saga Arashiyama including Monkey Park (touristy but fun! ), surreal Sagano Bamboo Forest, Togetsukyo Bridge, Tenryuji Temple, and the “Silver Pavilion”. You will also participate in a traditional tea ceremony with over a dozen steps including the respectful exchange of greetings, eating the tea sweets, mixing the green powder tea and water with the bamboo whisk. In the later afternoon, you will be transferred to Hiiragiya Ryokan. You will be assisted in boarding the Shinkansen train from Kyoto Station to Hiroshima. Upon arrival in Hiroshima, you will be taken to Peace Memorial Park and Peace Memorial Museum. Both moving and disturbing, this visit should be a historical, eye-opening experience. The Peace Memorial Museum graphically illustrates the history of the A-bomb and its dramatic effects on the citizens of Hiroshima (August 6, 1945). In the afternoon, you will board a ferry to Miyajima Island, considered one of Japan’s three most scenic views and a UNESCO World Heritage Site. It is famous for Itsukushima Shrine, which, together with its large wooden torii (gate), stands in the ocean during high tide. Deer move around the island freely, as do monkeys on top of Misen, the island’s largest mountain. You will have the opportunity to enjoy the sunset on the island before a ferry returns you to Hiroshima. In the morning you will be assisted with boarding a Shinkansen to Okayama Station where you will be met and driven to Uno Port for a ferry ride to Benesse House on Naoshima. Naoshima is a somewhat remote island located in the Seto Inland Sea of Japan and is famous for its striking architecture, art museums, and many unusual sculptures. Benesse House Hotel exists in harmony with the nature around it, having been built mostly underground so as not to impose too much on the surrounding landscape. Despite its almost-completely underground location, the museum gets much natural light exposure, providing varying experiences with the art contained within, depending on the time of day and season of the year. AAfter breakfast, you will enjoy a full day private tour of Naoshima including the Chichu Art Museum, Lee Ufan Museum, and the Art House Project. All a part of the Benesse Art Site, this site aims to create signi­ficant spaces by bringing contemporary art and architecture in resonance with the pristine nature of the Seto Inland Sea. The 24-story Peninsula has the best luxury hotel location in Tokyo, directly across from lovely Hibiya Park (think 5K run! ), Imperial grounds, and adjacent to the amazing Ginza shopping district. Envisioned by architect Kuzukiyo Sato to look like a giant Japanese stone lantern, the freestanding Peninsula combines subtle Japanese hospitality with the Peninsula tradition of understated luxury. The rooms are among the largest in Tokyo, starting at 544 sq ft. Cool amenities range from bedside consoles that control the drapes to Lavazza espresso machines. The rooms even offer the ladies a personal nail dryer! For our jogging friends, the Peninsula offers a nice 5K start to your day. Beginning across the street on the Imperial Palace’s grounds, a full 5K jog runs through the grounds and back through Hibaya Park. Zen rates the hot chocolate and the Peninsula’s amazing “vitality” pool as the best in all of Japan! Gora Kadan is a superb ryokan (traditional inn) that has managed to compromise gracefully with the modern Western world. Proprietress Mikawako, the third generation of Fujimotos to run Gora Kadan, has blended traditional Japanese ryokan hospitality with modern Western design in creating a luxurious ryokan spa experience. The Gora Kadan’s original building dates back 300 years and was the summer home of the Kan’in-No-Miya imperial family. With its airy east-west fusion aesthetic, its wonderful (Kaiseki) food service, and total relaxation spa, Gora Kadan is definitely on our A-list for high-touch ryokans in Japan! The Lynch family first discovered this heavenly place back in 2014. An approximately 1.5 hour drive south of Kanazawa, this 10-room ryokan retreat is arranged in traditional sukiya style, overlooking the pristine nearby Yamanaka River. The Kayotei’s onsen/hot springs overlooking the deep-forested hills, provide a quiet, relaxing sanctuary for those wishing for a remote getaway. A walk along the river trails offers an invigorating experience before being served the Kayotei’s locally-sourced kaiseki dinner. Being such a noteworthy local ryokan, the Kayotei highlights the work of local artisans: woodworkers, papermakers, soy sauce brewers, among others! 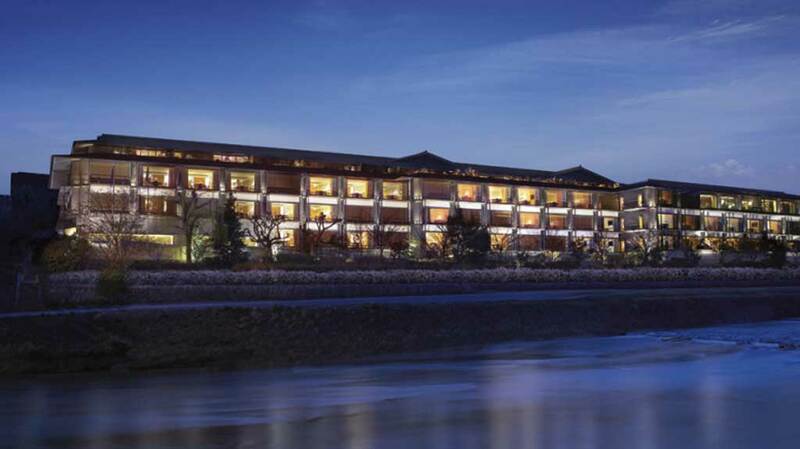 With the Hyatt Regency Kyoto having been the only western 5-star luxury hotel in Kyoto, we were excited about the February 2014 opening of the 134-room Ritz Carlton Kyoto. Living in a Mies van der Rohe high-rise in Chicago, we feel a particular affinity to the Hyatt Regency’s simple, clean, architectural design. Nevertheless, the new Ritz Carlton’s rectangular, low-slung property ideally situated in the Kamogawa River has definitely piqued our interest. Replicating the aesthetics of a traditional Meiji House, the design and amenities of the Ritz are quite impressive (including a French Haute Patisserie!). Though we are not big fans of the Ritz global brand (prefer AMAN/Peninsula/Mandarin/Four Seasons), we feel the new Ritz to be currently the highest quality luxury “western” hotel in Kyoto. Similar to Tawaraya Ryokan (just across the alley-way), Hiiragiya is considered among the most note-worthy and famous ryokans in all of Japan. Improbably, two of the most famous luxury ryokans in all of Japan stand directly across from each other! A stay at Hiiragiya or Tawaraya represents a complete immersion into traditional Japanese culture. Enclosed in a traditional sukiya style wooden structure, Hiiragiya was conceived in 1818 when Hiiragiya, a seafood dealer, began providing accommodation to traveling merchants. Later, Hiiragiya welcomed many members of the imperial family including writers/governing officials/international celebrities. Proprietress Akami Nishimura only modestly acknowledges the many celebrities and world leaders who have stayed here (including Charlie Chaplain many decades ago). We give an A+ to both the Tawaraya and Hiiragiya, although we feel Hiiragiya is perhaps more accommodating and open to Western eccentricities. Among the many 5-Star luxury hotels we have used throughout the world, I cannot recall us staying at a Sheraton. However, we were most impressed with our recent visit to the relatively new 238-room Sheraton Hiroshima, beyond a doubt the finest hotel in Hiroshima. You should enjoy the heartfelt, friendly staff and the updated room amenities. The 65-room Benesse House Hotel, the central lodging facility within “Benesse Art Site Naoshima” consists of four buildings: Museum (10 rooms) allows close contact with the artworks both in a public exhibition space and in each guestroom; Oval (6 rooms), offers beautiful panoramic view of the inland sea and is connected to the museum by a monorail; Park (41 rooms) looks out to the green lawn with open-air artworks to the ocean and the mountains of Shikoku on the far shore, and contains an exclusive lounge, a shop and Spa; and Beach (8 suites), located on the shoreline with suites only, provides beautiful view of the Seto Inland Sea.